The object case notes says 'Case under Professor Moncrieff'. 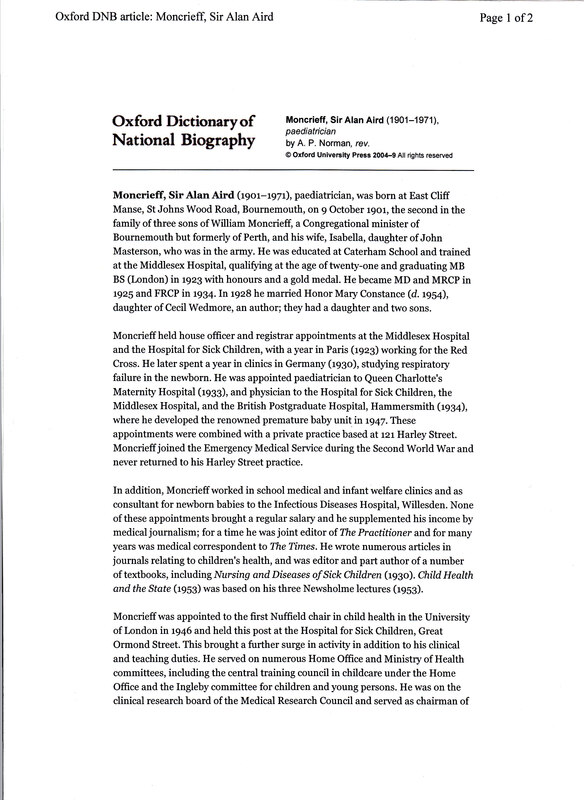 I was interested in finding out more about this consultant and sure enough the Oxford Dictionary National Biography (ODNB) has an entry for Sir Alan Aird Moncrieff (1901 - 1971). The basic biography says that Moncrieff was the son of a Congregational Minister, born in Bournemouth though the family was originally from Perth. Alan Moncrieff became a doctor in 1925 at the Middlesex Hospital, London and went on to specialise in working with sick children, or paediatrics. Much of Alan Moncrieff's early work was in maternity healthcare at Queen Charlotte's Maternity Hospital and Middlesex Hospital and with new born infants - he developed a renowned premature baby unit at Hammersmith in 1947. He published widely on causes for infant mortality and preventative measures. 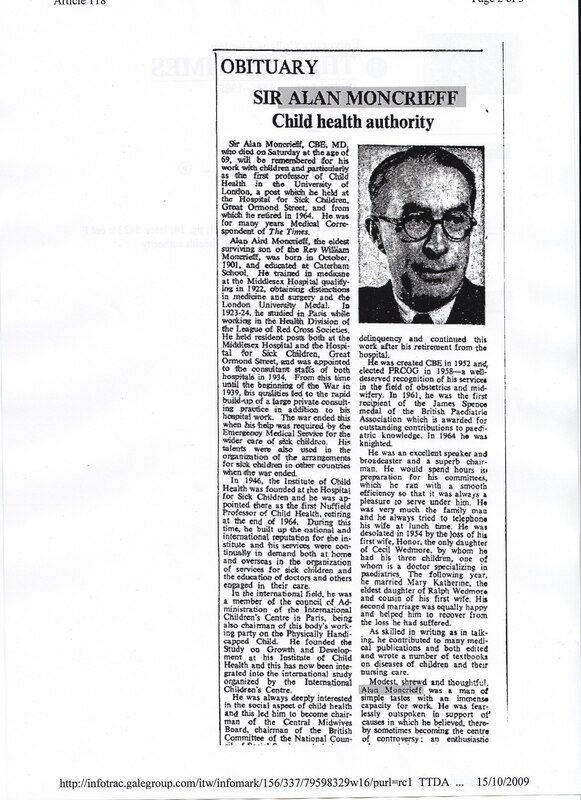 In 1946 Moncrieff was appointed the first Nuffield chair in child health in the University of London and held this post at the Hospital for Sick Children, Great Ormond Street. He was later involved in various research and government committees as well as being on WHO and UNICEF. 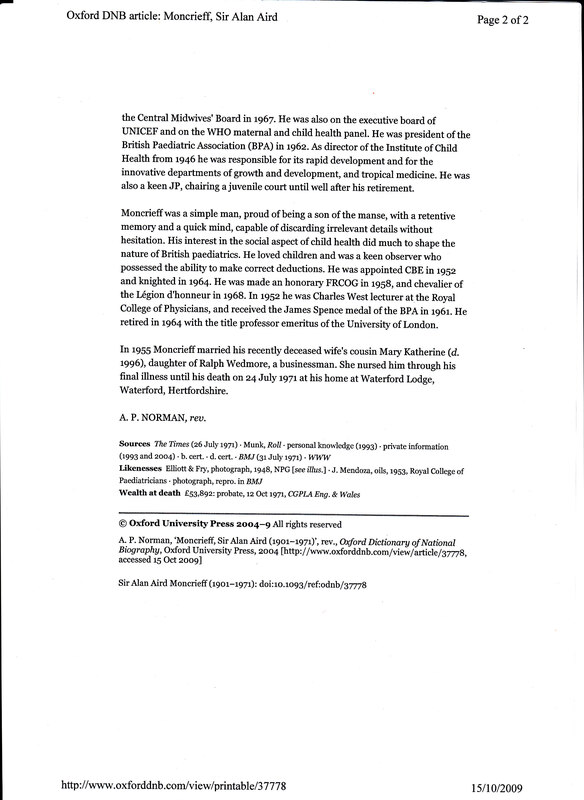 My interest in reading the ODNB entry was sparked by the fact that Moncrieff was not only a leading doctor but also, at one point, medical correspondent for The Times and so I checked out The Times Digital Archive online to see what was there. This brought up a whole raft of articles / letters / notices and it was clear that Moncrieff promoted public engagement with medicine and healthcare. Moncrieff was involved in the pasteurisation of milk during WW2, an expert in advising on the Children's Act 1948, correcting medical errors publshed in the press, the soocial factors behind health and disease, breast feeding, the role of the state in healthcare, nutrition, more understanding of teenagers, fundraising for Great Ormond Street and creating hospitals in East Africa.